The NHL expanded to twelve teams for the 1967-68 season, ending a six-team circuit that had been in place since 1942. However, collectors of hockey cards were forced to wait a year to see the new uniforms, because 1967-68 Topps Hockey included players from the original six teams. Card fronts featured a player picture superimposed in front of artwork that looked like the grandstands of an arena. A solid-colored area beneath the photo contained the player's name, which was separated by his team and position by a diagonal line. Each corner of the picture area has been rounded off, with a white border surrounding the card. Backs are reminiscent of the previous year's set, with all info included inside a black box. The player's name, team and position appear at the top. A puck-shaped icon at the upper left contains a card number, with a short biography beside it in English. Stats from the previous season appear below that, with vital statistics thrown in. At the bottom, a French translation of the biographical paragraph appears. 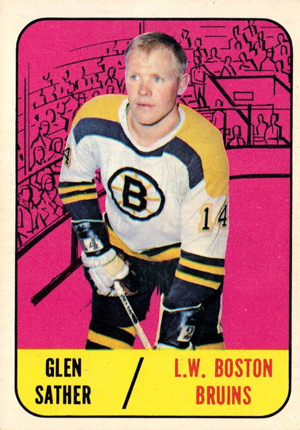 Only six teams were included in the 132-card 1967-68 Topps Hockey set. Two checklists are included, as well as four cards honoring the winners of major awards from the previous season. The final 12 cards of the set featured the first- and second-team All-Stars. Key rookies in the set include Jacques Lemaire, Derek Sanderson, Glen Sather and Rogatien (Rogie) Vachon. The most information I’ve seen for vintage memorabilia and easy to use.